Run-length encoding is one of the most trivial forms of data compression methods. It works by combining runs of characters into a value containing the number of times that character is repeated in the run and the actual character itself. In this case, the encoded version of the text has been reduced by ~73%. 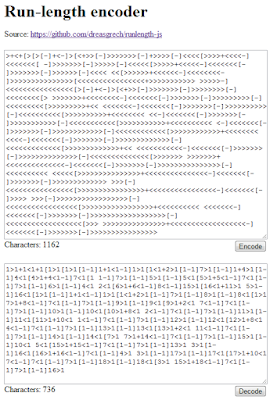 But note that there may be cases where the encoded text would end up larger than the actual (decoded) plain text; this happens when the text contains many isolated characters rather than runs of characters. Take for example abcdefghijklmnopqrstuvwxyz (26 characters); if you 'compress' that using a run-length algorithm, you'll end up with 1a1b1c1d1e1f1g1h1i1j1k1l1m1n1o1p1q1r1s1t1u1v1w1x1y1z (52 characters) which is a 100% increase from the decoded version. 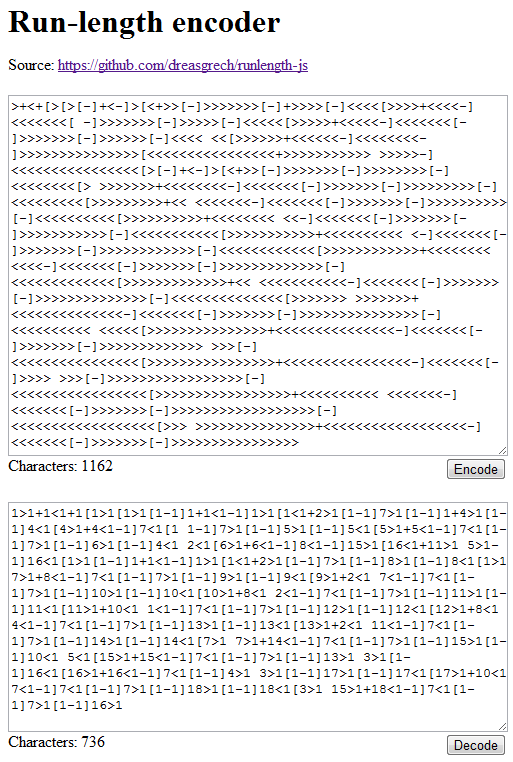 Note that as of current, the code does not handle instances where the decoded text contains digits.